Review by AllTheBestFights.com: 2017-12-09, close and tough fight between Denis Shafikov and Rene Alvarado: it gets three stars. Denis Shafikov entered this fight with a boxing record of 38-3-1 (20 knockouts) and he is ranked as the No.12 super featherweight in the world but he comes off the loss against Robert Easter Jr (=Shafikov vs Easter Jr). Before this bout, in 2016, he had won over Jamel Herring (=Shafikov vs Herring) and Richard Commey (=Shafikov vs Commey). His opponent, Rene Alvarado, has an official record of 27-8-0 (19 knockouts) and he entered as the No.43 in the same weight class. He has already fought four times in 2017 losing to Yuriorkis Gamboa (=Gamboa vs Alvarado) but then he has defeated Moises Olivas, Roger Gutierrez and David Morales. 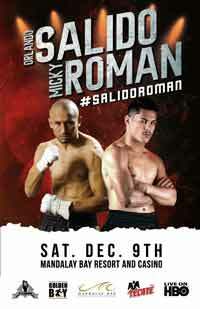 Alvarado vs Shafikov is on the undercard of Orlando Salido vs Miguel Roman. Watch the video and rate this fight! Review by AllTheBestFights.com: 2017-06-30, good performance by both boxers: Denis Shafikov vs Robert Easter Jr gets three stars. The undefeated Ibf Lw champion Robert Easter Jr entered this fight with a perfect boxing record of 19-0-0 (14 knockouts) and he is ranked as the No.3 lightweight in the world (currently the #1 in this division is Jorge Linares). He won the vacant Ibf title last year against Richard Commey (=Easter Jr vs Commey) and he defended it once in 2017 with Luis Cruz (=Easter vs Cruz). His opponent, Denis Shafikov, has an official record of 38-2-1 (20 knockouts) and he entered as the No.9 in the same weight class. He lost to Rances Barthelemy in 2015 (=Barthelemy vs Shafikov) but then he has beat Jamel Herring (=Shafikov vs Herring) and Richard Commey (=Shafikov vs Commey). 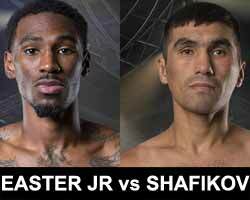 Robert Easter Jr vs Denis Shafikov is valid for the IBF World lightweight title (Easter’s second defense). Watch the video and rate this fight! Review by AllTheBestFights.com: 2015-12-18, great performance by both boxers: Rances Barthelemy vs Denis Shafikov gets three stars. The former Ibf super-Fw champion Rances Barthelemy entered this fight with a perfect record of 23-0-0 (13 knockouts) and he is ranked as the No.5 super lightweight in the world (currently the #1 in this division is Terence Crawford). He has fought twice in 2015 winning over Angino Perez (=Barthelemy vs Perez) and Antonio DeMarco (=Barthelemy vs DeMarco). His opponent, Denis Shafikov, has an official boxing record of 36-1-1 (19 knockouts) and he entered as the No.3 lightweight. He suffered his only loss last year when he faced Miguel Vazquez, after this bout he has won three consecutive fights beating Roy Mukhlis in his last one (=Shafikov vs Mukhlis). Barthelemy vs Shafikov is valid for the vacant IBF World lightweight title. Watch the video and rate this fight! Review by AllTheBestFights.com: 2015-07-18, disappointing fight between Denis Shafikov and Roy Mukhlis: it gets two stars. Denis Shafikov entered this fight with a boxing record of 35-1-1 (19 knockouts) and he is ranked as the No.4 lightweight in the world (currently the #1 in this division is Omar Figueroa Jr) while his opponent, Roy Mukhlis, has an official record of 27-4-3 (21 KOs=78%). Shafikov’s only defeat occurred in 2014 when he faced Miguel Vazquez, after this bout he has won over Rustam Nugaev (=Nugaev vs Shafikov) and Miguel Angel Mendoza. 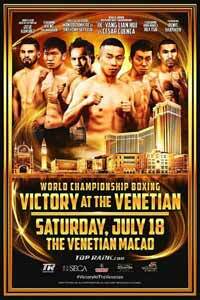 Shafikov vs Mukhlis is on the undercard of Ik Yang vs Cesar Cuenca. Watch the video and rate this fight! 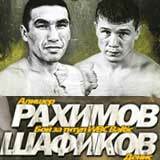 Review: 2014-08-15, great performance by both boxers: Rustam Nugaev vs Denis Shafikov gets three stars. Rustam Nugaev entered this fight with a professional boxing record of 27-6-1 (17 knockouts) and he is ranked as the No.7 lightweight in the world (currently the #1 in this division is Terence Crawford), he suffered his last defeat in 2011 when he faced then-undefeated Alisher Rahimov, since then he has won six consecutive times. His opponent, Denis Shafikov, has an official record of 33-1-1 (18 knockouts) and he entered as the No.5 in the same weight class, he suffered his only defeat just six months ago when he faced Miguel Vazquez in a bout valid for the IBF Lw title. Nugaev vs Shafikov is the main event of the night, IBF lightweight title eliminator. Watch the video and rate this fight!